The first families enrolled for the 2019-20 school year at our Thompson's Station campus will be part of the Founding Families, and receive $1,000 annually off their tuition per child. Please contact Suzanne Brown at sbrown@gcalions.com for more details on the Founding Families program. The annual tuition is payable in 12 equal payments. The first payment is due June 1, 2019 and will be due the 1st day of each month in 12 monthly installments beginning June 1st and ending May 1, 2020. In addition to tuition, a re-enrollment deposit will be collected February 1, 2020. A $50.00 NON-REFUNDABLE Application Fee must be submitted with the Student Application Form for any NEW student entering grades K-4th. 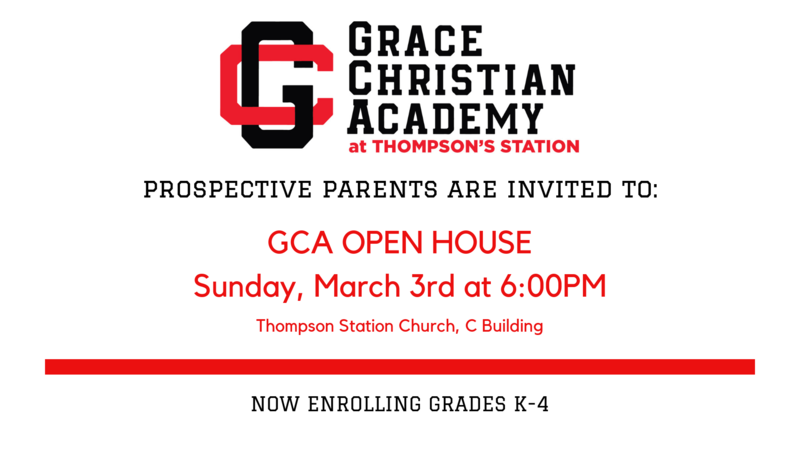 The initial Application Fee is a one-time fee to each student the first year the student enters Grace Christian Academy. On February 1, 2020, GCA families will be billed for the Re-enrollment deposit. This fee is $250 per student with a $500 maximum per family. This will secure your child's spot for the 2020-2021 school year. This deposit will be applied to your student's next year's tuition balance. The tuition scale for grades K-4 includes a multi-student family discount of $90 for the second student enrolled, $250 for the third student, and $1,000 for the fourth and fifth students. PLEASE NOTE: Parents whose students are accepted after June 1st will be billed retroactively to June 1st on their first billing date. The parent or guardian is responsible for the annual tuition when a student is enrolled. Withdrawal of a student during the school year does not void the financial obligation to the school. Families who move from the school area (75 miles or more) during the school year are exempt from the tuition obligation, provided all incidental fees and other billing are paid prior to a student's withdrawal. Tuition includes all textbooks, novels, standardized testing materials, teacher gift fees, and PTF membership fees. These listed items are non-refundable.